Two women who were abducted by Boko Haram in north-eastern Nigeria have given a rare account of life as captives of the Islamist militants. “They asked me if I am Christian or Muslim. I said I am Christian,” said 23-year-old Liatu, as she recalled her ordeal in the hands of Boko Haram. She was stopped at a roadblock set up last year by the Islamist militant group. She said any Muslims employed by the government were killed on the spot, as Boko Haram had earlier warned them to leave their work. She was taken to the insurgents’ base in Borno state’s Sambisa forest, where the bloodshed continued. “They were slitting people’s throats with knives. Both women and men were killed – especially the men who didn’t agree to fight for them,” she said. Liatu says the insurgents were usually tipped off about any imminent attack by the Nigerian army. This allowed them to hide in caves and forests close to the Cameroonian border. The Nigerian army says it is currently hunting down the Boko Haram fighters in this extremely challenging terrain. Liatu spent 15 days in captivity and refused to eat anything. Then, after being told about the proposed marriage, she made an extremely risky escape. Nineteen-year-old Janet was held for three months. She says that Boko Haram tried to turn her into a killer. She says she recognised the faces of the men who held her captive. “I knew almost all the people in the group I was with. I knew them from my home area,” Janet says. Janet says her life was spared as a result of this outburst. One of the great fears people have today stems from not knowing exactly where Boko Haram has a presence in the country and whom you can trust. A businessman from Borno state told me he had helped the Nigerian police arrest 11 Boko Haram members in the capital, Abuja. Some working on market stalls, he believes, are sent to be the eyes and ears of the group. It is a worrying indication of Boko Haram’s desire to maintain a presence way beyond the north-east of the country. I met a teacher who survived last month’s attack on a boarding school in Yobe state, in which 29 boys were killed. He was so scared he wanted his identity hidden, even though he now lives far from Yobe. He did not even want me to reveal where he now lived. He described the moment the gunfire erupted. “I peeped through the window and saw the gunshots coming in… and there was a lot of shouting,” he says. The names of the women escapees in this piece have been changed for their safety. 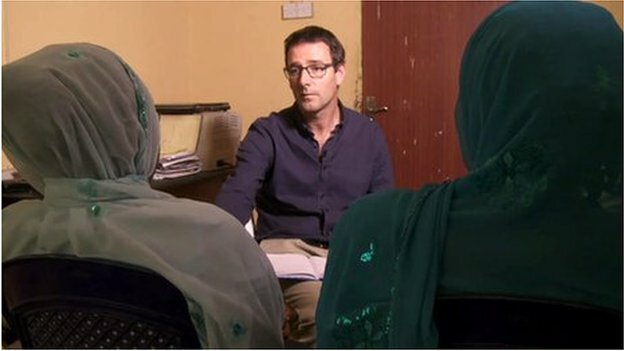 This entry was posted in Men, News, Politics, Women and tagged Latest On Boko Haram, Story Of Two Women Who Escaped From Boko Haram's Hostage.